Edgewood Cabin at Sherando Lake is a beautiful, 2 bedroom, 1 bathroom cabin that can accommodate up to 6 people. It features all of the comforts from home including electric fireplace, dishwasher, washer and dryer, open deck, outdoor fire pits, picnic tables, and high speed Wi-Fi. The master features a king bed, and the second bedroom has two queens. The fully furnished kitchen has all the standard appliances, including stove, refrigerator, microwave, coffeemaker, toaster, and even a dishwasher. No need to bring along pots and pans, as you’ll find them in the cabinet, along with dishes and silverware. Even dish cloths, soap, and paper towels are provided. Edgewood Cabin in Virginia is convenient to the Blue Ridge Parkway and Sherando Lake. November is a great month to plan a trip to the Shenandoah Valley and our region of Virginia’s beautiful mountains. We are moments away from all of the wineries, historic sites and places to visit in Augusta County and Waynesboro. Relaxation is our mission for our guests and strive to promote and provide a calm and peaceful wilderness environment at our cabins in Virginia. At our compound your group can get back to nature and experience all of the natural beauty that surrounds. Edgewood’s rates are low in November! Most of the month you can stay at Edgewood Cabin for $159 per night and only a few periods are two night minimum stay required periods. We love passing along the savings these tremendous savings to our guests. 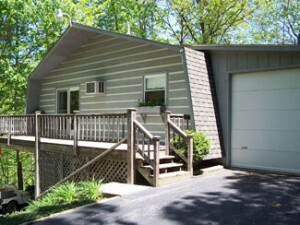 If you are searching for the perfect two bedroom cabin, check out the Edgewood rental. Here’s a tour of the inside of the cabin rental. This rental is available before and after dates around Thanksgiving Day and the day after. If you are able to book a getaway, this cabin rental in Virginia offers great deals and lots of convenience. Ski Season is right around the corner! Thinking of taking a Virginia / Wintergreen ski trip this year? This cabin is available for Wintergreen Ski trips, and is only a short drive from the resort. Accommodations prices are much lower than staying at the resort itself and we offer a truly unique ski trip experience. Give us a call to discuss dates that are available for this upcoming winter/Wintergreen ski season and we’d love to host you and your ski group this snow season.